With consumer progressively spending on vehicles with advanced features, automotive laser headlight manufacturers see forth impressive prospects to capitalize on. In the coming years, the demand for automotive laser headlights is expected to accelerate and so will the pace of gains for the leading market players. According to a recent study by Transparency Market Research (TMR), manufacturers are more likely to invest in the miniaturizing headlight systems without compromising on the quality and intensity of light. Besides this they are likely to strategize dynamically to sway demand in their favor. As per TMR, the global automotive laser headlight market currently exhibits a highly competitive vendor landscape. In Europe, OSRAM GmbH holds dominance accounting for a share of over 50%, rendering the vendor landscape consolidated. However, markets in Asia Pacific and North America have a fragmented landscape. 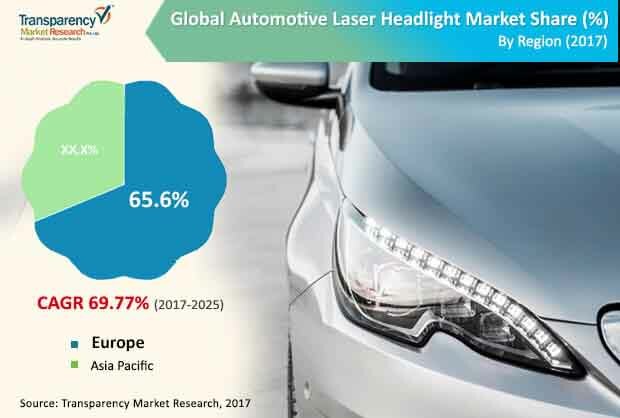 Most prominent names in the global automotive laser headlight market are looking to expand their product portfolio to gain edge over competition. In addition to this, many engage in strategic collaborations to strengthen their foothold. According to TMR, the global automotive laser headlight market will exhibit spectacular progress at 69.77% CAGR. At this pace the market’s worth will reach a whopping US$359.29 bn by 2025 as against US$1.09 bn in 2016. Based on vehicle, the demand from the passage vehicles segment is likely to surge ahead of their commercial counterparts. Regionally, Europe is forecast by TMR to emerge dominant. In 2016, Europe held nearly 40% of the global market. The region is expected to continue dominating the global market through the course of the report’s forecast period. Increasing traffic flow and the rising occurrence of accidents have necessitated the need for high intensity automotive headlight for safer driving. The need for advanced automotive lighting is reiterated as governments implement stringent safety regulations to enhance road safety. These regulations will create an environment conducive to the growth of the global automotive laser headlight market. Since laser headlight offer high intensity light and thus increases visibility of road during night time travel, it has become a preferred feature in most vehicles. Furthermore, consumers are willing to spend on advanced safety features, which is likely to give impetus to the global automotive laser headlight market in the coming years. Also, with automakers continuously upgrading their models to woo customers, the demand for advanced automotive laser headlight is expected to rise further in the coming years. Furthermore, the market will gain from the rising use of sensors in laser headlights. On the downside, laser headlights are yet to show efficiency in adverse weather condition. This factor limits their sales in regions experiencing continuous rainfall, fog, and snowfall. Besides this, the high cost of automotive laser headlights may also limit their sales in underdeveloped economies. Nonetheless, with several technological advancements on cards manufacturers are likely to resolve these concerns in the near future, thus offering growth opportunities to the global automotive laser headlight market.